Yes, I said "tookies". I have this other language I speak to the dogs. Come on you dog lovers, I KNOW you know what I mean!! The dogs know what I am saying and I know what I am saying, isn't that all that matters? I have been told that my language is used a bit more than the average, but, I talk to the dogs alot. They never get mad, they always love me, and they love my music and TV shows! The dogs I am speaking of are my sisters dogs, however, since losing our beloved black lab 2 years ago, we have adopted them as our children too! Lucy is the biggest lapdog (105lbs of pure love and chub) of a female choc lab I have ever seen, and Ava is a pretentious, yet sweet, red pointer lab. I have been on the lookout for a great recipe for dog treats for awhile. I have found many of them, but they all seemed to require specialty ingredients and I wanted to find something you could make out of your own pantry. I got this one from the vet clinic! Lucy is my taste tester so I gave her a taste of the dough and she loved it! (I know because she TOLD me, duh) :) I used a heart, and a dog bone for cookie cutters. The bone was probably bigger than I might have liked but if you have a big dog, they will be just fine. 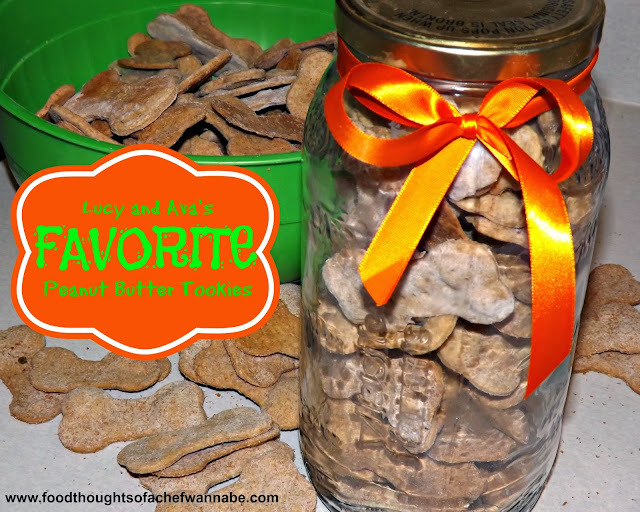 This recipe calls for organic peanut butter, however I used regular peanut butter and for the record, its perfectly fine for dogs. I had to pick up wheat flour but that was it, everything else is regular pantry staples and I think wheat flour will be now as well. So, let's get to the recipe so your doggies can get some special "tookies" of their own tonight! Preheat the oven to 350 F. Combine oil, peanut butter and water. Add flour, one cup at a time, forming a dough. Knead dough into firm ball and roll to 1/4 inch thickness. I just do this in my stand mixer. Place on an ungreased cookie sheet. Bake at 350 F for 20 minutes. Makes approximately 2 1/2 dozen cookies. These are too cute and so are your pooches! I love doting on my dogs, but they are as lucky as yours. I might have to give this a try and spoil them a little!